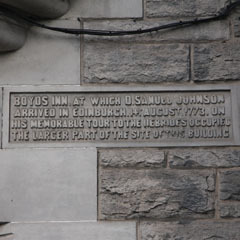 This pub was where James Boswell, Edinburgh lawyer and biographer of Samuel Johnson, met up with Johnson before they embarked on their famous tour of the Hebrides in 1773. Boswell had first met Johnson when he was living in London in 1763 and the two had become close friends. Johnson wanted to visit the Highlands in part to try to prove that the supposed works of the ancient Gaelic poet Ossian, which were causing a literary sensation at the time, were not genuine, but had in fact been written by their supposed translator, James Macpherson. 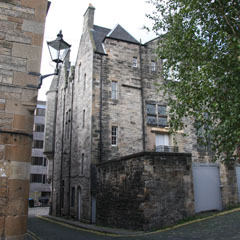 Many of the leading figures of the Scottish Enlightenment, including Hugh Blair and Adam Ferguson, energetically supported the authenticity of the work. 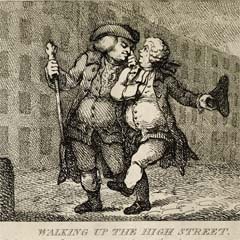 Caricature of Johnson and Boswell walking down the Royal Mile. 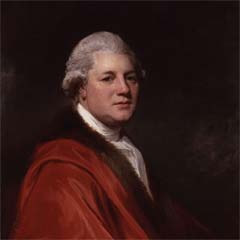 Portrait of James Macpherson (1736–96) by George Romney. 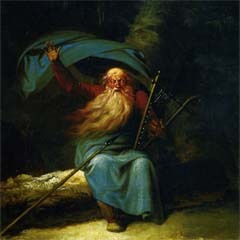 Ossian Singing by Nicolai Abildgaard, 1787.